Numerous patents have been registered since the foundation of the company. Developments for dentists by dentists include a sophisticated system of tooth filling matrices, the so-called Walser® matrices with forceps. This perfect modern system is the outcome of exhaustive scientific and practical experience and the continued development of a wide variety of shapes and sizes. Here you find the listing of the many advantages with detailed information. The largest part of our products we develop and produce in Radolfzell, Germany. 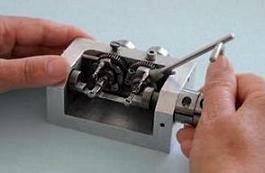 Many parts are manufactured with great effort by hand since the company was founded. It is very important for us to hold and to safe jobs in Germany.